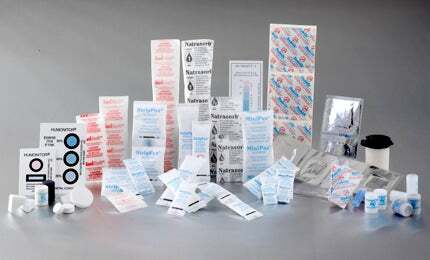 Multisorb Technologies provides internationally recognised solutions to protect and manage healthcare product packaging being affected by oxygen, moisture, hydrocarbons or other substances. The company’s products are used throughout the medical industry, ensuring stability and consistency of in-vitro diagnostic, drug delivery and medical device products. Multisorb personnel have extensive experience in the healthcare industry to ensure that any product stability issues are easily resolved. Customers are assisted by the use of a quality by design (QbD) based Calculations through Operations® programme. The entire development process is assessed, from design through to dispensing, taking specific sorbent requirements into account and providing solutions. This approach makes sure that decisions made in the developmental phases by engineers and chemists match-up with those taken in the product packaging stage. A multi-step approach is implemented, where sorbent formulations are calculated with precision, the correct sorbent configuration is developed, and the sorbent solution is then delivered. Sorbent product are optimised by the company through use of its proprietary SimulSorb™ and SimulOx™ pseudo-empirical modeling programmes. These programmes help the prediction of outcomes in physical and chemical stability for healthcare products, devices, or components in their packaging. In addition, the SimulSorb modeling programmes are particularly useful for predicting the presence of moisture in packaging or devices by determining the equilibrium relative humidity (ERH). The SimulOx programme is able to provide a similar approach for managing oxygen found in healthcare packaging. However, when managing specific volatilized hydrocarbon in package headspace, it can be necessary to eliminate oxygen and moisture entirely. There may also be instances when moisture needs managing and a specific humidity needs to be maintained. In such cases, Multisorb’s multifunctional IntelliSorb® intelligent sorbent formulations have proven effective. When an optimized sorbent formulation has been established, it is presented in a Drop-In, Fit-In, or Built-In format that best fits the product’s needs. The company’s Drop-In sorbent solution manages oxygen, moisture, odor and any volatilized hydrocarbons found in secondary packaging. This solution consists of a sorbent in packet or canister positioned inside the pouch. Fit-In solutions are produced to fit a specific space within a design and are compressed form sorbents. These provide improved protection against moisture in the same dimensional space, substantially boosting the level of functional moisture management per unit volume. Built-In solutions offer technologically advanced moisture management capabilities that are invisible to consumers. Sorbent material is built into an existing thermoplastic component, enabling sorbent protection in products that would not have any space available otherwise. The customized Drop-In sorbent can be inserted into existing drug product packaging through use of its corresponding APA-series sorbent dispenser. Multisorb’s systems-based sorbent / dispenser approach provides optimal precision, efficiency and dependability, while offering high-quality solutions to make sure stability is present through a product’s entire shelf-life. Multisorb Technologies will highlight its medical spill and liquid containment solutions at the AORN Surgical Conference & Expo in Anaheim, California from 3-6 April. Multisorb uses its SimulSorbTM and SimulOxTM proprietary pseudo-empirical modelling programs to design an optimised sorbent solution for moisture, oxygen, and volatiles management based on parameters specific to a product. IntelliSorb Sorbent Formulations offer steady state or multi-functional control of moisture, oxygen, and volatilised organic compounds. Multisorb has launched the PolySorb desiccant card, a low-profile desiccant for managing moisture in a range of products, including packaging of in-vitro diagnostic device kits, transdermal pharmaceutical delivery systems and foil pouches. Multisorb Technologies will highlight how its Success through Efficiency programme helps companies quickly identify, select, and dispense the optimal sorbent at the American Association of Pharmaceutical Scientists (AAPS) Meeting and Exposition. Multisorb Technologies will exhibit at InnoPack from 13-15 October in Madrid, Spain. Multisorb will exhibit at Pack Expo in Las Vegas from 28-30 September with representation from its four market sectors, which are healthcare, food and beverage, electronics, and logistics and industrial. Multisorb Technologies is pleased to announce the appointment of Ms Irene Low to the position of business development leader of Healthcare Packaging East Asia and Australia. Multisorb Technologies will highlight how the efficiencies of its sorbent dispensing systems and simulation technology can help pharmaceutical companies and drive profitability at Pharmapack North America from 9-10 June at the Jacob K Javits Convention Center, New York. Multisorb Technologies will showcase its sorbent technology for respiratory drug delivery (RDD) devices at RDD Europe in Antibes, France, from 5-8 May 2015. Multisorb Technologies has announced it will be exhibiting at Interphex in New York, from 20-22 April 2015. Multisorb Technologies has announced it will exhibit its medical spill and liquid containment solutions at AORN Surgical Conference and Expo in Denver Colorado from March 8-10 2015. Multisorb Technologies will exhibit its sorbent technology and solutions at MD&M West. Multisorb Technologies is proud to announce the appointment of Mr Alex Jan Wagteveld to the position of business development leader, Northern Europe, Healthcare Packaging, as part of its global expansion. Multisorb Technologies will be exhibiting at CPhI and P-MEC India exhibition from 2-4 December at the Bombay Convention and Exhibition Centre in Mumbai, India. Multisorb Technologies is proud to announce the appointment of Peter Lirusso as business development leader of Healthcare Packaging Canada.